This is the only set of its kind! A complete set of handmade high-carbon steel tools for detail and miniature work, it is a necessity for the professional and amateur alike. The set comes in a canvas roll with individual pockets. 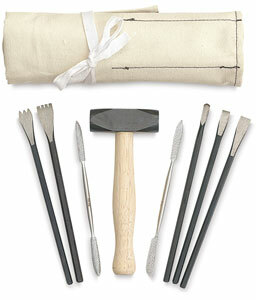 Tools in the set include a 3 tooth chisel, 4 tooth chisel, rounded chisel, flat chisel, small point chisel, 2 rasps, and 1 lb hammer. The average tool length is 7½".